The Canal Museum at Foxton Locks0116 279 2657work Museum - TransportThe Canal Museum building was home to the boiler and mechanical workings that powered the Caissons (barge containers) up and down the Inclined Plane, and now after extensive refurbishment, it shows not only how it all worked, but also brings to life what it was like to live and work on the canals and locks of the Victorian waterways. Containing many fascinating exhibits of the time, the Canal Museum demonstrates how tough it was to make a living showing how families survived the harsh conditions of 19th century canal life. The Canal Museum does much more than simply display these original artefacts, it allows you to interact with them. The centrepiece being an interactive game where the whole family can stoke the boiler to create the right conditions for the Inclined Plane to successfully operate. When you achieve the exact boiler conditions, the loaded barges make their journey up and down the Inclined Plane, all in real time. Progress is visible on large projection screens where the Inclined Plane can be seen operating in a fully recreated virtual reality world. Hearing the sounds of the boiler coming up to temperature, with dials to monitor, and the Caissons moving, this becomes a completely immersive experience. To make the most of your visit make sure you download the free Foxton Discover App – either ahead of your visit or at the The Canal museum. Upgrade the App to give you views of a virtual reality Inclined Plane boat lift, take part in the Foxton Quest to solve an age old mystery and explore Foxton Locks site on the Discovery Trail. If you upgrade the App you will gain discounted entry in to the Canal Museum. 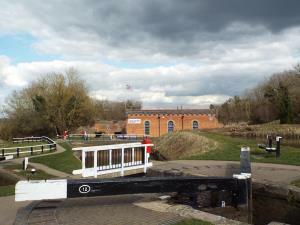 Visit www.foxton-locks.co.uk to plan your visit and download the App. The Canal Museum building was home to the boiler and mechanical workings that powered the Caissons (barge containers) up and down the Inclined Plane, and now after extensive refurbishment, it shows not only how it all worked, but also brings to life what it was like to live and work on the canals and locks of the Victorian waterways. The Locks site is open and free to visit at all times. If you visit by car there is a small parking charge, £1.50 all day in the long stay or £2.00 for 4 hours in the short stay.